HOUSE leaders yesterday condemned in the strongest possible terms the ambush against Iligan City Rep. Vicente “Varf” Belmonte Jr. yesterday afternoon. House independent bloc leader and Leyte Rep. Martin Romualdez, Speaker Feliciano “Sonny” Belmonte Jr., and House Majority Leader and Mandaluyong City Rep. Neptali “Boyet” Gonzales II called on the authorities to arrest the perpetrators. “Our authorities should immediately arrest the suspects for them to face the full force of the law. We condemned this cowardly act in the strongest possible terms,” said Romualdez, a lawyer and president of the Philippine Constitution Association (Philconsa). Speaker Belmonte also aired similar call, saying that the ambush “appeared to be well planned,” although Varf Belmonte, who chairs the House committee on dangerous drugs, was not wounded in the attack. “This is a very serious concern. Several people have fired their guns from different directions as per phone conversation with Congressman Varf Belmonte. We are calling on Camp Crame to exert best efforts. 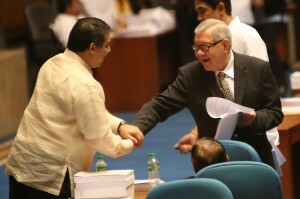 Political rivalry is probably behind it,” said Speaker Belmonte. “This is very disturbing and alarming, I hope our concerned authorities will be very quick in apprehending the suspects,” said Gonzales. According to Varf Belmonte, he arrived at the Laguindingan Airport from Manila at 1:30 in the afternoon when unidentified men blocked and opened fire at his convoy going to Iligan City.